Pheasant cushion with art work by Sarah Drew of Bath Art Works. 45 cm x 45 cm including feather pad , all made in England. 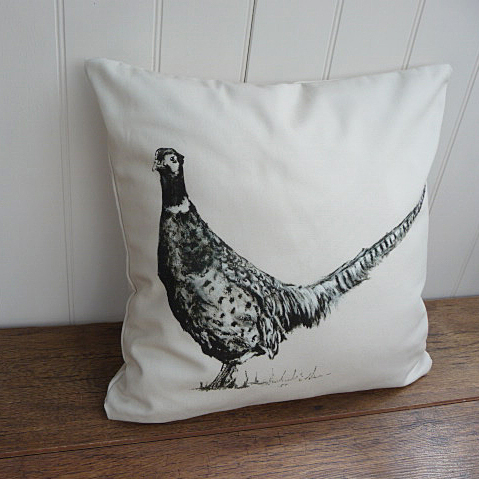 This Pheasant cushion features original art work in beautiful monochrome tones. This style and colour will sit happily in a modern interior as much as in a traditional country interior. These colours will look especially good on a simple wooden chair. Sarah Drew creates hand illustrated luxury home ware inspired by the British Countryside. Studying art at Bath College and Textile Design at Weston College Sarah then went on to undertake a career in the Law Sector. After having a family and settling in a rural location, Sarah returned to doing what she enjoys most – Creating images of the things that she loves. The British countryside, animals, and nature and this is where Sarah gathers much of her inspiration. She also loves anything vintage and has always enjoyed browsing around vintage markets and antique fairs. Her work is a celebration of the British way of life.